$298 each. 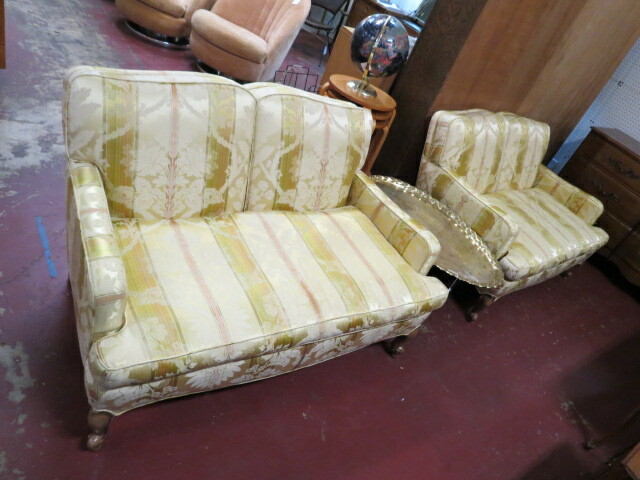 Vintage antique French style pair of settees/loveseats, c. 1950. Pretty gold damask with a stripe upholstery. Curved arms, walnut cabriole legs. Can be used in many configurations: across from one another, at a 90 degree angle with a table in between, or together on a long wall with a table in between. Perfect for your living room. Excellent condition. 50in wide, 34in deep, 31in tall.